Need a little inspiration from Exile On Main Street? Maybe these messages can help! Good God, Arde, how do you keep this up? Every single day all summer--and now more! And they're all freaking brilliant!!! The eggs, LOL--they're yellow, he just can't help himself! And I think I got just a little emotional over "Identity". 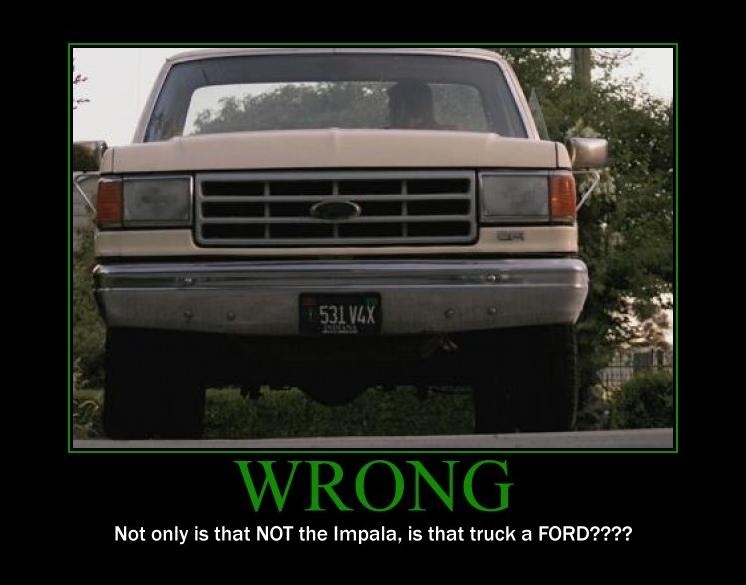 Ford pickup, ha--which one's a bigger insult to the Impala, the Ford or the Charger? I love those Arde. Thanks for keeping those posters coming. I love the eggs...I was thinking, geeze Dean enough with the salt!! Hey! Nothing wrong with Ford trucks!!! Certainly better than a Prius! Lovely stuff, Flamey, just as lovely as our favourite heroes are! Thank you ever so much for these!!! i love these, they make me laugh so much. i keep forwarding them to my friend who sits opposite me at work and watch as she struggles not to laugh. I love the one about the eggs! i thought something similar when i was watching the episode (with that much salt they really can't be edible). Heh ... Spot on with the eggs, I reckon every single person watching who ever cooked anything was having the same thought at that point! Thank you for keeping these rolling on. They are a lot of fun and now we get a slide show for the week...very cool. That salt on the eggs too caught my eye. (Alright, going to put on my Monday-morning quarterback hat and suggest this, had they given us the shot of the big canister of salt but had Dean go past it for a small salt shaker instead and salt the eggs I think it would have worked too...even with the juxtaposition of salting windows and doors with canisters and bags...just saying. Yep, 'tis a Ford...all is not well in Dean's world. 'Wrong' had to be my fave! HA A FORD?!? 'Baby''s gotta be fuming overthat one! FORD?!? We all know what a Ford is right? It's a F***ed Over Rebuilt Dodge!! And when you put a Ford in reverse - Driver Returns On Foot! HAHAHA yeah their old jokes but MAN are they CLASSIC! These are phenomenal! I love the one for IDENTITY; I said the exact same thing in my review. 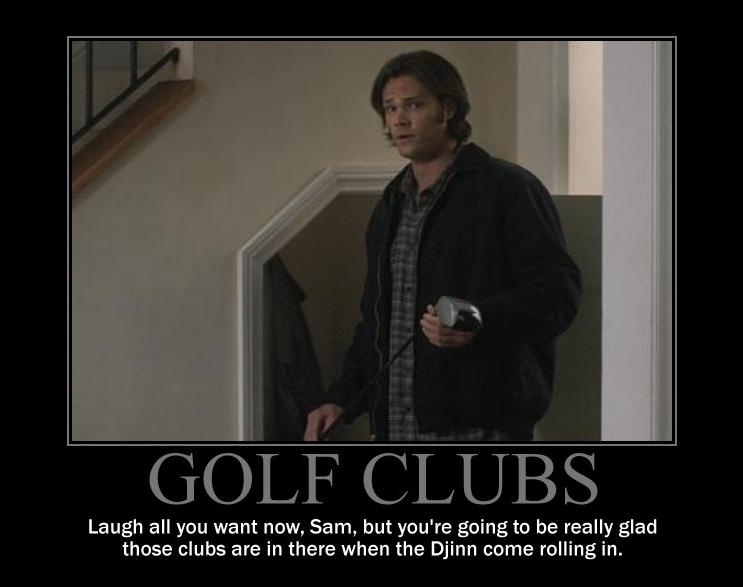 My favorite is definitely the one with Sam dissing Dean over the golf clubs. 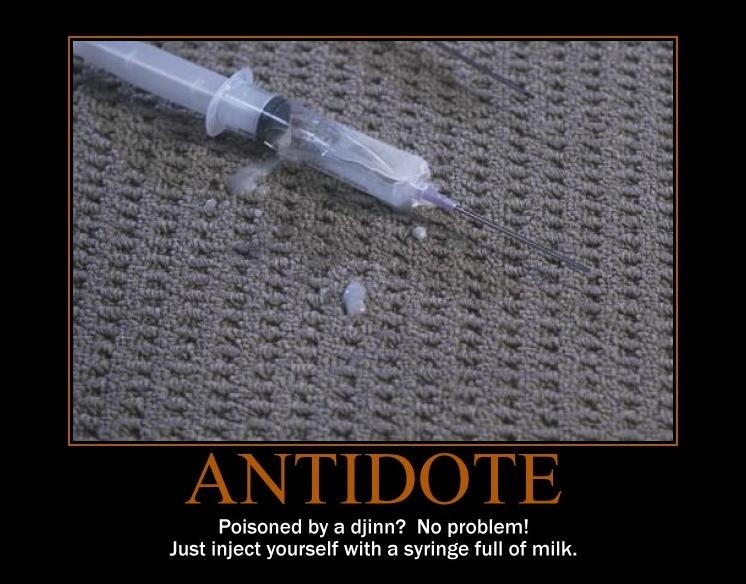 They sure did come in handy when the Djinn came a-knocking! We know that salt repels demon, well, maybe that's the reason Dean is pouring loads onto the eggs. If Ben and Lisa eat a lot of salt, they'll never get possessed. These are GREAT, as always!! 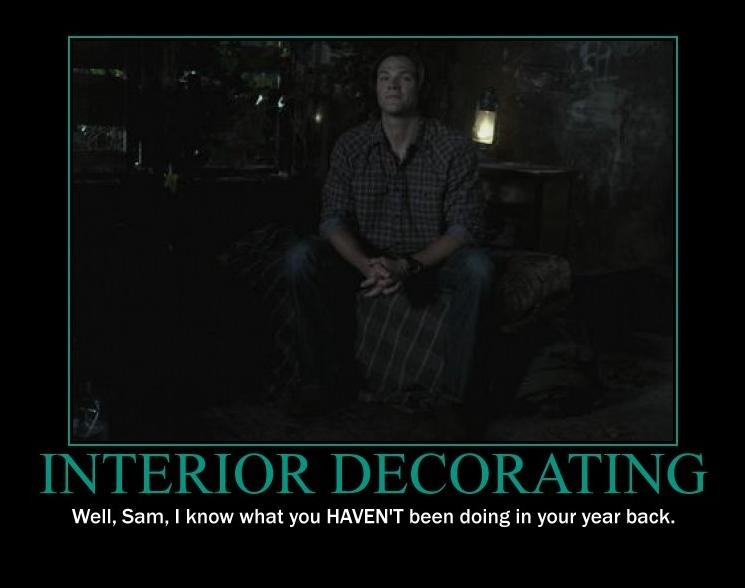 I LOL when I saw Dean pull that gigantic salt shaker down from the cupboard. Who buys salt like that? Apparently Dean buys his salt from the gas station in Lazarus Rising. Elena M, the key to doing these is to not have a life! No, I kid. I think the bigger insult is the Charger because I don't like the new Chargers AT ALL. At least the truck is practical. Yirabah, you're welcome! Happy to oblige, as always. Sweetondean, he just kept shaking and shaking. And maybe I'm the only one, but I never salt my eggs. Pepper yes, but salt? No thank you! Tigershire, I would take a Prius over a truck any day. Unless it was one of those sweet '30s trucks. Those are rad. But for Dean...yeah, it's better than a Prius, I begrudgingly admit. Jas, liebes, you got the preview, so I do know! Thanks so much, dear. Bethany, almost getting people in trouble at work is my middle name. I think my parents were drunk when they gave it to me. Glad you and your coworker are enjoying them. Dany, I was on a roll, so I just went with it. I certainly wasn't expecting 7 either. But hey, why not? You do love the serious ones, don't you? Got to have those to temper the funny, I guess. Suze, they probably were! And then the next thought was "Ben, don't eat those! You'll have blood-pressure problems for the rest of your life!" RobinV, thanks! You did say the same thing, didn't you? Great minds! I will confess to not having read your review when I made these, but it's funny that we both came to that line. And nothing like a golf club to beat some sense into someone. Not that I've ever done that, of course. 9Tiptoes, thanks! And I will fess up to buying salt like that. Mine's a giant container, just like the one Dean grabbed, of sea salt in big chunks, and I put it into a salt grinder. Salt grinder and pepper grinder -- they're so fun! But it grinds down the salt into normal, fine pieces. Dean sure doesn't have that excuse. Nah, slam all you want! My auto company is thriving while the other two are bankrupt. I think Dean knows this. Everyone's comments had me giggling too. This GM girl is gonna keep out of the Ford vs. Charger vs. Prius dilemma. I know where my heart lies, but to each her own! Hey, Alice, my dad was a huge Ford fan all his life. Those were the only cars he would allow. HIs daughter however, strongwilled and stubborn, settled for Opel. You won't cut off my fingers now, o powerful admin of this site? And here you were concerned you wouldnâ€™t be able to pull off doing a daily poster and yet you did seven. Loved them all, especially the eggs and golf one. As for a Ford truckâ€¦I always thought they were the leading makers of Trucks? Not sure about the car side of it, as I heard jokingly that Ford stood for Found On Road Dead. Oops maybe I should of whispered that, wouldnâ€™t want Alice to hear. I love every single one of these, but I've gotta say: Precaution, Golf clubs, and idenity were my favorites! XD Hilarious! "Salt the hell out of those eggs, Dean. 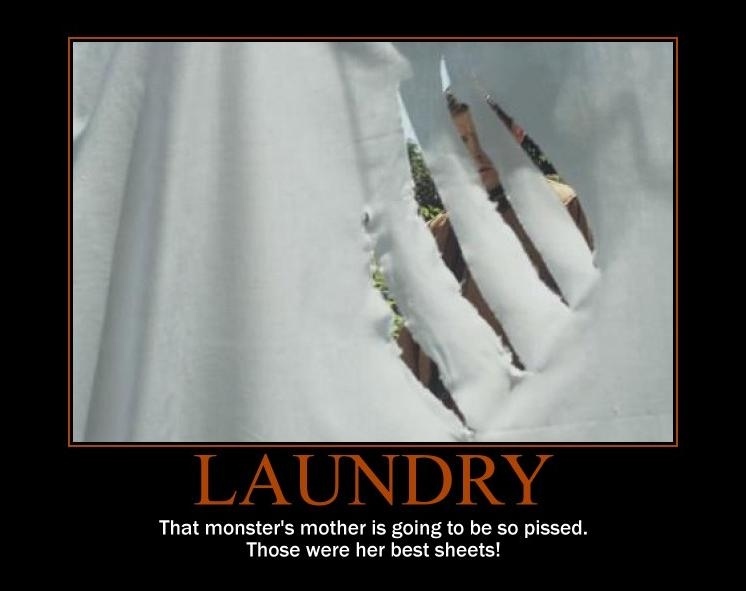 There's probably a demon hiding in them." Oh.. I can't wait for more. 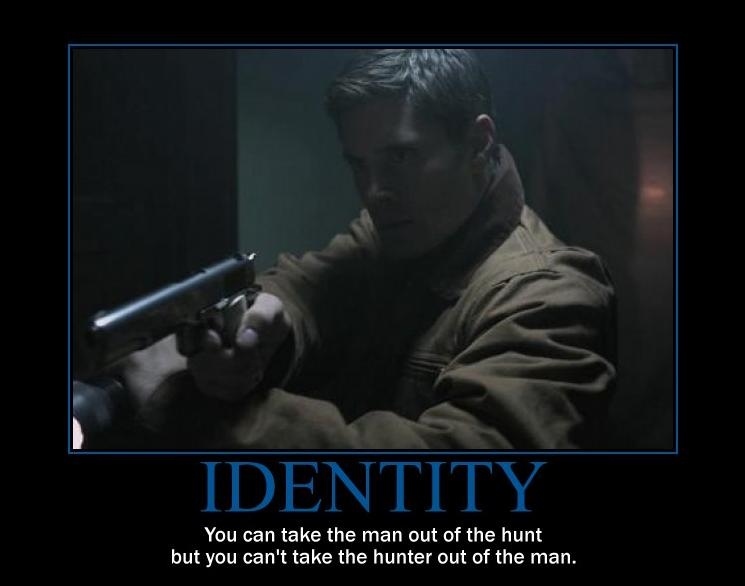 The phrase on the Identity poster is exactly what I said while watching that scene! Love it! I love these. Good work, Arde. 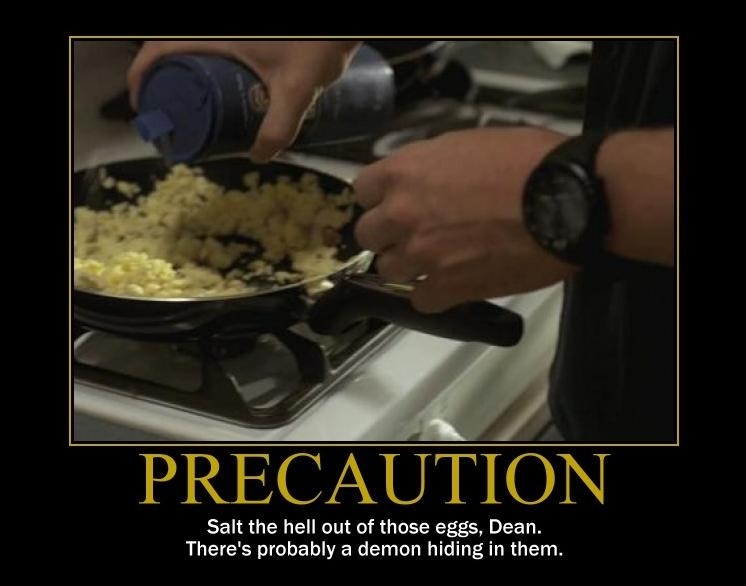 Salt precaution - I just laughed when I noticed how big the salt container was that Dean used to salt their eggs. Indeed, the hunter has not completely left him. And c'mon, don't knock Ford, it's a true American car.